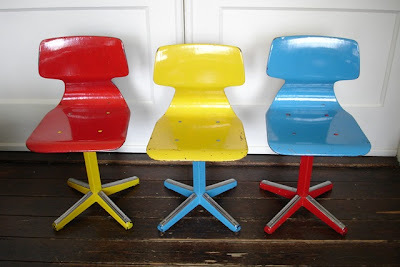 My three kids are too big for these vintage industrial chairs but what a fantastic feature they would make in a nursery, bedroom or play space! Perfect for Colour My Monday, don't you think? Galvanitas Oosterhout furniture (60's) from new-to-me Dutch design shop Bestwel Hip.